You're at the communal coffee pot at the office. You take a pink packet one day, a blue packet the next. You tried the towering cylinder of table sugar that's next to the bowl of packets, but you can never get enough in your Styrofoam cup to make your coffee sweet. And the calories, don't forget your fear of the calories that come with that glucose/fructose mix too. So you keep trying the blues and pinks and yellows. What's in these packets of artificial sweeteners and how are these chemicals made? We'll answer those questions and look at the health benefits (or detriments). Aspartame (the blue packets packets and a component of most diet soft drinks, brand names Equal & Nutrasweet) and saccharin (the pink packets, brand name Sweet'N Low) are between 200-300 times sweeter than the same mass of sucrose, while sucralose (the yellow packets, brand name Splenda) is 600 times sweeter. The relative sweetness values, however, do not take into account the additives that might go into a packet of sweetener, so no, 600 packets of natural sugar doesn't equal one yellow pack of sucralose. These artificial sweeteners pose the dietary "benefit" of adding few calories to the food or drink you are consuming, while significantly increasing the sweetness. This allows for people who suffer from sugar-dependent maladies (like diabetes) to enjoy a little sweetness in their food when they would otherwise not be able. 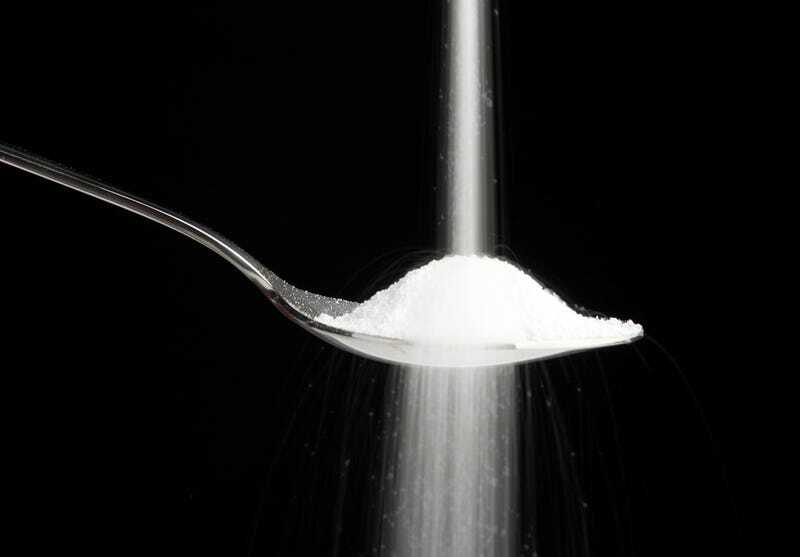 How are artificial sweeteners made? Interestingly enough, all three common artificial sweeteners were discovered by accident when a chemist decided to taste the product of one of their experiments, a big lab no-no. Aspartame came about as a byproduct of researchers trying to find a way to heal gastric ulcers in the 1960s, while saccharin was discovered in the late 1800s by a coal tar researcher who spilled a flask on his hand and noticed his bread tasted sweeter. The discovery of sucralose in 1976 tops all of these, however, as it was found by an individual researching sugar intermediates who misunderstood a set of directions and thought he was supposed to "taste" each of his reaction products. Silly scientists, they'll eat (and maybe do) anything. Sucralose (Splenda) is made using sucrose as a starting point in a chemical reaction, with additional chlorines substituted on the molecule. The added chlorines in sucralose make it difficult to metabolize, resulting in the low calorie count as it passes through your body and is excreted in urine and feces. Aspartame is made from the joining of two amino acids, aspartic acid and phenylalanine, while saccharin can be made through a number of ways, with no starting material resembling a naturally occurring sugar or natural product. Consumer fear concerning current artificial sweeteners possibly arises from the number of artificial sweeteners that have been removed from retail sale in the past several decades, like dulcin and cyclamate, which was often used to sweeten powdered drinks. A 1969 study showed that a mixture of cyclamate and saccharin caused bladder cancer in rats. Further studies showed that cyclamate to be involved in birth defects, liver cancer, and shriveled testicles, causing the FDA to quickly remove it from the U.S. market. Cyclamate is still available for sale as an artificial sweetener in Europe and Canada. Saccharin has since been shown to not contribute to bladder cancer, and although it has had a tinged past, the EPA stated in 2010 that it is completely safe for human consumption. Aspartame has come under fire recently in message boards and media reports; however, the FDA still considers it safe when consumed in normal quantities, and the European Food Safety Authority study deemed that large scale consumers are still well under the limit for safe use. Aspartame, however, is of harm to those with phenylketonuria, as one of the metabolites of aspartame is phenylalanine.Ongoing academic studies concerning the intake of large doses of sucralose are being conducted, with no substantial negative affects found yet, however, it has been shown to reduce the amount of bacteria in the digestive tract of rats. These additives have been approved by the Food and Drug Administration, and are closely monitored on both an industrial and academic level. Which one you use, if you choose one, pretty much comes down to personal preference. As a trained chemist, I prefer sucralose, as it mimics the chemical structure of glucose the most. For some unvalidated reason, that makes me feel better. If you are wary of artificial sweeteners, you could try an alternative naturally occurring chemical sweetener like xylitol, which has less calories than retail sugar, helps fight tooth decay, and can prevent ear infections. Also, just because there are no calories added to a food or drink due to an artificial sweetener, this shouldn't influence the quantity you consume. And while they may work great for sweetening your drink in a hurry and cutting some calories, artificial sweeteners may not work the same as typical sugar in cooking due to their different chemical properties. Whatever you do, don't let your mom make brownies using only Splenda - it doesn't turn out well. Brownies should never be able to bounce. The top image is courtesy of Shutterstock, with other images courtesy McNeil Nutritionals and Xlear. Sources linked within article.